The Musk's home in Stetchworth was known as "Ivy House Farm". The main farmhouse and barns were situated at 23 High Street, Stetchworth and occupied fields and buildings on both sides of the road. The pigstys were across the road from the farmhouse and this site was developed in the late 1980s into a small housing estate. In 1884 the Musks were recorded as selling and making “Newmarket” sausages to a secret recipe that wa s later handed down through the generations. So successful was the recipe that the couple became very prosperous and opened their third shop on Newmarket High Street in 1905. But this must have been a strain for James Musk who dies later that year. It seems probable that, in the 1880s, the Musks build a major extension to the barn for use as a slaughterhouse. The slaug hterhouse stands to this day and the equipment for dispatching the pigs (see picture left) is still there and in working order. However, the last pig was killed in 1928 when the slaughterhouse was finally closed. Pig bones and teeth can still be dug occasionally up in the garden. 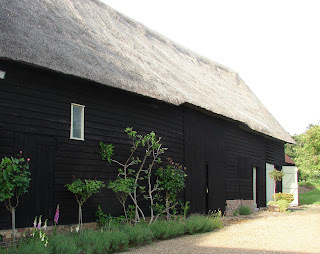 The barn, which is also grade 2 listed, has some unusual features. The slaughterhouse has louvered wooden slats which can be opened by turnin g a central wooden post in each "window". This allows fresh air to flow through the slaughter-house area which, with many terrified pigs about, would have smelt awful. The pond outside was dug for chalk to make lime to dispose of the inedible remains which, in Victorian times, would have been very little. The house also has a Victorian extension shown right, which may have b een added by the Musks. The 1891 census shows a "Master Builder" as lodging with the Musks. Was he responsible for the house extension and the barn? Ivy House Farm is now a private residence but retains the charm and Victorian look of its illustrious earlier residents. After the Musks left it became the home of the Dowager Countess of Elsmere who lived there until the early 70s when the building, in real need of updating, was tastefully and accurately restored by the renown local architect Stephen Mattick. The kitchen top is old marble allegedly from the butcher's work surfaces of the Musks. Perhaps Elizabeth's first "Newmarket" sausage spices were mixed there?